The owner of the journal is Turkish Society of Public Health Specialists. 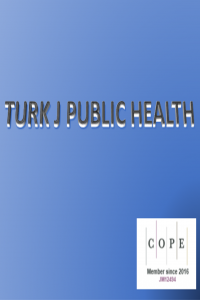 The Turkish Journal of Public Health (Turk J Public Health) is a peer reviewed, bilingual (English/Turkish) research journal published online three times a year and serving a broad audience in the field of public health and community medicine both nationally and internationally. Turk J Public Health aims to provide a medium for the rapid communication of advances and new knowledge in this field. The editor anticipates receiving manuscripts from the following areas of research: Health policy and management, biostatistics, epidemiology, environmental health, health economics, demography, social sciences for health, health education, health promotion, , community nutrition, infectious diseases, disaster management, injuries, women's health, reproductive health, child health, chronic diseases, and occupational health. Turkish Journal of Public Health is a member of Committee on Publication Ethics (COPE). TURKISH JOURNAL OF PUBLIC HEALTH - TURK J PUBLIC HEALTH. online-ISSN: 1304-1096 - Copyright holder Turkish Journal of Public Health. This work is licensed under a Creative Commons Attribution-NonCommercial 4.0 International License.